The issues with the AI from the last engine update attempt have been resolved. This time, instead of applying the latest update, we're asking players to test the beta branch. Be sure to report any issues and post if you test so we can judge the effectiveness of the beta branch approach. I don't know if it's the firewall here (in China) or what, but this version says "running" when I start it from Steam, but I never see the actual lobby come up. There's just a window that shows a copy of whatever was on my desktop when I started the game. I had it come up once after starting this version for the first time, but it seemed frozen, none of the buttons worked and the account status was just "Connecting" for several minutes. So I killed the process and tried again, and so far haven't been able to get the lobby to show up properly. Beta isn't available any more. 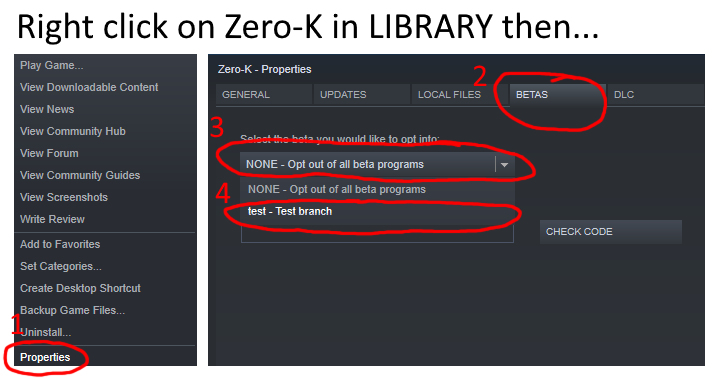 I uninstalled Zero-K, and installed it again from Steam (not test branch). It seems to run ok, but no Steam overlay. I have the "test branch" in Steam still available. Yes, test branch is available again. I did a test-battle with lots of fleas. Game started to lag earlier than on old engine... sad. The 913 engine seems to crash with campaign map Planet Caderical (Zenith mission). It crashes when the loading bar is near complete and the text reads Loading Skirmish AIs. Probably because of old engine AIs used on the map? ZK comes with two AIs, built for the two engine versions. I've tested and found no issue with running AI games on the beta branch. I still get crashes starting campaign missions on the test branch (Linux Ubuntu 18.04 64-bit). These occur on at least Planet Sapphire (Sapphire Shores against Chicken and AI) and Planet Caderical (Zenith). Log about Caderical: https://pastebin.com/PjwnJPvF seems to indicate that skirmish AIs load, at least partially. They don't occur at least on Planet Tempest (Ultimatum mission). Made PR recently that should fix devAI crashes on campaign missions. Because crashes are user-data (startscript) dependent it is not 100%-reproducible for different players on the same mission. This one? I'll wait for it to be merged then. In steam one can choose "beta branch" again. No crashes here either, all good so far!